whiskerDocs®, the leading provider of telehealth support for pet parents, is pleased to announce their new joint initiative with Careington, a top provider of health and wellness discount programs in both the U.S. and the UK. The trend to provide pet-friendly work places and benefits is gaining momentum in the United States largely because, more often than not, pets are considered family. Offering pet insurance and pet care services is an ideal way to establish work places as pet-friendly. “Most pet owners contact us trying to determine whether their pet needs immediate attention,” says Trevor Page, president and co-founder of whiskerDocs. “They're contacting us to find out if they have to take time off work to deal with a health concern related to their four-legged family member. Our data shows that nearly 80% of the issues that come up do not require urgent veterinary intervention. This makes the pet owner happier, keeping employees at work, reducing anxiety and stress for both the pet parent and the pet. In short, 10 minutes with whiskerDocs can save hours of time at an emergency clinic. And that's good for everyone." Careington is now offering whiskerDocs, the leading 24/7 pet hotline providing instant, real-time access to veterinary experts as part of an extraordinary suite of products and services. 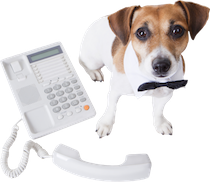 Headquartered in Skokie, IL, whiskerDocs supports close to 1 million pet parents throughout North America, offering telephone support, email, mobile messaging and live chat services. Since 2011, whiskerDocs has been providing advice to pet parents for behavior, emergency, wellness care, training, and questions about symptoms. Visit whiskerdocs.com to learn more. Since 1979, Careington International Corporation has provided affordable, money-saving solutions to members in the U.S. and is the first company to bring discount dental and vision programs to the U.K. Dedicated to improving access to affordable care, Careington’s non-insurance discount plans can be marketed as stand-alone products or can complement more traditional insurance options to deliver savings for under-insured or uninsured individuals. Careington provides innovative, money-saving health and wellness solutions to more than 15 million members. For further information on our products and services, on-site administration and custom marketing solutions, visit http://www.careington.com.